The WRIA 55/57 Watershed Plan was adopted on January 31, 2006 by Spokane County, Stevens County, and Pend Oreille County. The objectives of the planning effort were to address water resource issues, provide local management of water resources, and coordinate and consolidate water management practices. The watershed plan includes recommended actions to achieve water management goals established in the plan. 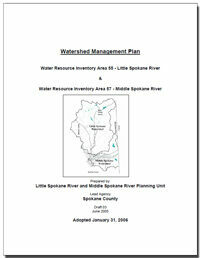 In addition to the WRIA 55/57 Watershed Plan a subgroup developed a plan for the West Branch of the Little Spokane River, a subbasin of the larger watershed.